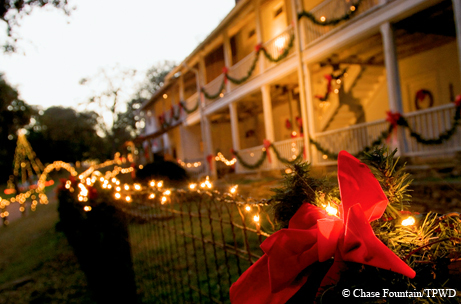 Two historic sites light up the holiday season. Forget long lines and noisy crowds at the mall. Instead, Greg and Andria Holloway of Fayetteville celebrate Christmas by taking their two children to Monument Hill and Kreische Brewery State Historic Sites to tour the Trail of Lights. For more than two decades, volunteers with the Friends of Monument Hill and Kreische Brewery have dressed up the sites and hosted the holiday event that features sparkling light displays, vintage German decorations, candles and lanterns, refreshments and live music. So are daytime views. That’s when you can look down and see the Colorado River from the same scenic overlook, one of many stops along walking paths that also wind past the park’s two namesakes — the monument and brewery. “We’re unique in that we have two historic sites in one,” Smith says. “But their histories blend very well.” Those histories begin at Monument Hill, where a towering shellcrete shaft, accented with an art deco-style mural, memorializes the 52 Texans who died in the Dawson Massacre in 1842 and the Black Bean Incident in 1843. A nearby granite vault preserves their remains. In 1849, German immigrant Heinrich Kreische bought the acreage that surrounded the men’s original sandstone crypt (later covered with granite in 1933). A skilled stonemason, Kreische built the aforementioned home plus a barn and smokehouse. The park also preserves remnants of his cobblestoned brewery, where he produced his highly popular Bluff Beer. Be sure to stroll the Kreische Woods Nature Loop (the newest of five trails in the 40.4-acre park), which wanders through several wooded acres previously off-limits to the public for more than 20 years. Visitors may tour the Trail of Lights from 6-8 p.m. Dec. 4, 10, 11, 17 and 18. Fees: $3 per person for those 13 years and older, $1 for children ages 3-12, under 3 free. Monument Hill and Kreische Brewery State Historic Sites are in La Grange. From the business district, take U.S. Highway 77 south across the Colorado River, then west 0.4 mile on Spur 92 to the park entrance. For more information, call 979-968-5658 or visit (http://www.tpwd.state.tx.us/monumenthill).